Fall is the time of year for Thanksgiving, and also the last cookouts and barbecues before winter sets in. It's also the time of year when the trees are their most beautiful, with the wonderful colors of autumn foliage. You can make the beauty of autumn leaves part of your decorations for Thanksgiving, or for any other occasion or get-together of the fall season. - This led garland light of beautifully colored and realistic imitation maple leaves is intertwined with a 13-foot string of 40 LEDs, making the wreath garland lights sparkle and glow with the LED's warm white light. - Use the leaf garland with lights to make a wonderful centerpiece for your table, or drape it over any piece of furniture in the dining room, or hang it around the frame of a mirror, or around your front door. - The leaf lights string are powered by their own compact battery pack, you can put the garland anywhere you like, indoors or out, without worrying about where to plug it in. - In the day time, the thanksgiving led lights look like a decoration garland, at night, when you turn it on, the garland will definitely light up your night and generate a warm atmosphere for any occasion. - This wreath garland with lights is operated by 3 AA batteries(not included). And the lights have a selection of 8 different modes of flashing, blinking, steady-on, etc. - The safe low-voltage battery power and the IP44 rating mean you can use these indoors or outdoors with confidence. 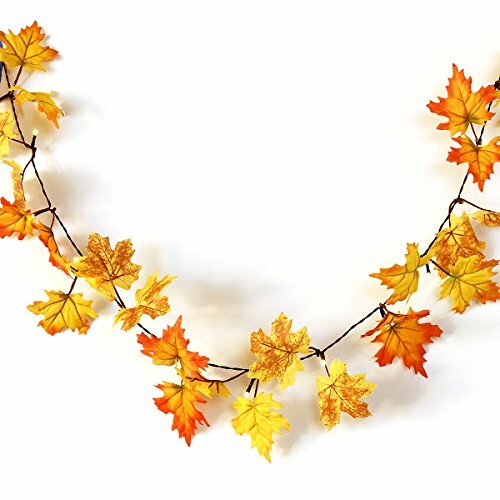 Order these thanksgiving decor garland today, and see just how wonderful it can be to use the colors of autumn leaves as part of your decor! 【A BEAUTIFUL GARLAND OF LIT-UP FALL LEAVES】-- In this string of lights, the LEDs are intermixed with realistic imitation maple leaves in their gorgeous autumn colors. The light garland is beautiful and filled with season atmosphere with multi-color. 【THE PERFECT CHOICE FOR THANKSGIVING DECOR】 -- Use the fall decor as a centerpiece to decorate your dining table, hang it elsewhere in the room, over and around your front door, for parties, stage, wedding, bedroom, night scenes, etc. Add a beautiful glow to your life. 【EIGHT DIFFERENT MODES MEET DIVERSE NEED】-- Flashing, twinkle, waves, sequential, slow-glow, chasing, slow fade and steady on. Choose one, or change the mode every now and then for fun, creating a warm and romantic atmosphere. 【IP44 WATERPROOF FOR INDOOR & OUTDOOR USE】-- The IP44 rating means these will stand up to any weather conditions if you use them outdoors. The power is safe low voltage from a battery pack, you can put the leaf light garland anywhere you like. 【RELIABLE 1 YEAR MONEY BACK GUARANTEE】-- Battery operated with 3 AA batteries(not included), without worrying about where to plug it in. if you're unsatisfied with this thanksgiving decor lights for any reason, we'll immediately refund your purchase price. Worth Imports Wild Fall Leaf Twig Wreath, 24"